It’s going to be a thrilling Halloween this year at Muffin Break with a $2 Muffins Day! For one day only on Wednesday 31 October, ALL your favourite muffins will be only $2, at stores nationwide. If you’re up for delicious treats – no tricks, we promise – make sure you stop in at your nearest store. Costumes are optional but we’d love to see you in your spooky best! Stock up for a Halloween party or bring the kids in with their school friends for a delightful treat! 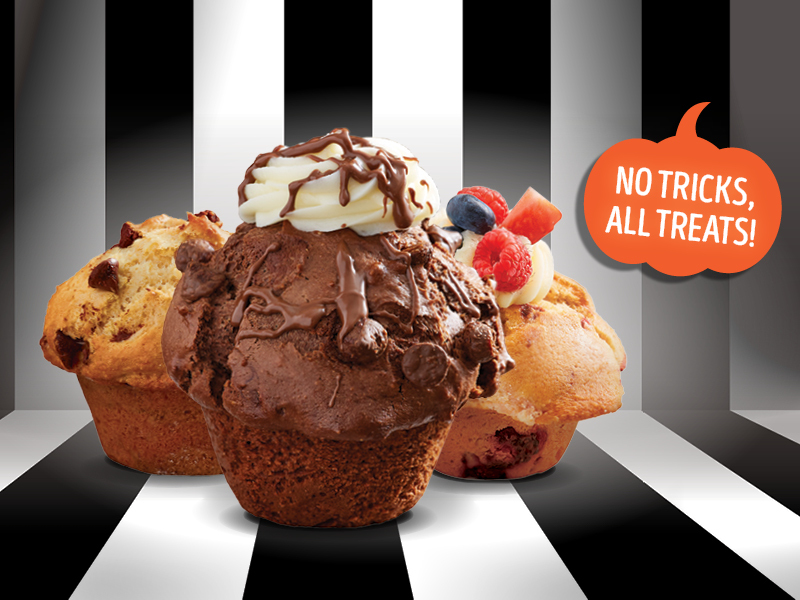 Choose Your Halloween Treat at Muffin Break! With $2 muffins on 31 October, your biggest problem will be which one to choose! Our Muffin Menu includes traditional favourites like Choc Chip and Orange Poppyseed, plus Gluten Free, Dairy Free and Lower Carb for those with special dietary requirements. Whether your taste buds are calling for sweet or savoury, whether you’re wearing a Spiderman costume or Wonder Woman tiara, we’ve got the treat for you this Halloween! Halloween seemed like the perfect day to reward muffin lovers across Australia with a special treat! Ever wondered how this spooky holiday got started? According to History.com, Halloween’s origins lie in a Celtic festival called Samhain (pronounced “Sam-Ween”) that dates back 2,000 years. The ancient Celts believed that the lines between the dead and the living were blurred on 31 October, before the change of seasons and winter closed in. To ward off ghosts, the tribes would light bonfires, wear costumes and have feasts. As with many pagan festivals, the Christian faith adapted the tradition as time went along. Pope Gregory III designated 1 November as All Saints Day, to honour Christian saints. The night before became All Hallows Eve, a time to remember the dead. During festivities on both days, the poor would visit the houses of wealthier families, where they would receive pastries in exchange for a promise to pray for the families’ relatives. This evolved into a practice where young people would dress up in costume and perform songs in exchange for treats. With emigration, Halloween has slowly evolved all over the world into a day of activities like trick-or-treating, carving jack-o-lanterns from pumpkins, outlandish costumes and indulgent treats! This is one sweet deal you don’t want to miss! Find your local Muffin Break store now to get your $2 Muffin! Limit 4 muffins per customer. Excludes Adelaide Airport. Not valid with any other offer.